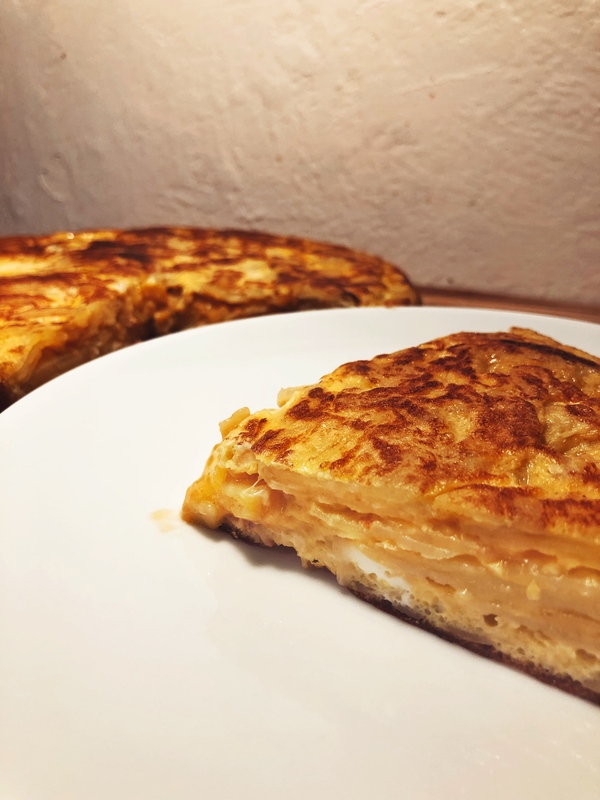 There’s rarely anything as simple and as satisfying as Tortilla Española or Tortilla de Patatas, the Spanish Omelette. This tapas classic has existed in Spain and parts of the Latin Americans since the 1600s, and it is still as popular today as the day it is invented. With only 4 ingredients, it’s savory and sweet, with a touch of smokiness, with an almost crispy crust on the surface, and a creamy, soft interior, like an aged cheese. Even though the traditional recipe doesn’t contain any onion, it was added to the recipe in the 1900s to provide some extra sweetness to the omelette. This recipe takes about 30 mins and serves about 4 people. Peel and thinly slice both the potatoes and onion, you can slice them with a knife, or save a lot of time and effort by using a mandoline. Heat up a deep pan over medium heat, pour in the oil and wait until the temperature rises to about 150C or 300F degrees. Add the onion first, fry for about 3 min, then add the sliced potatoes. Continue frying for about 12 min or until the potatoes are cooked through. Strain the fried potatoes and onion, gently mix them with the 6 eggs. Cover it with some aluminum foil and let it sit for about 5 min. Heat a well-oiled non-stick pan (with a 10-inch diameter) over high heat, add in the thickened egg mixture and cook for about 1 min, this will create the crust for the omelette. Then turn the heat down to medium and let the omelette cook for another 3 min. While the top of the omelette is still a bit runny, cover the top of the pan with a large plate, then flip the pan over, with the cooked part of the omelette facing up, and slide the omelette back into the pan. Cook for another 2 min over medium heat. Cut the omelette into wedges, you can serve them both hot and cold, enjoy!